Mexico’s varied geography has made it a premier destination for all kinds of adventure tourism, from caving and canyoneering to jungle treks, white-water rafting and rock climbing. This 6-minute video shows mountaineer Alex Honnold climbing the 460-meter (1500-feet) high rock face known as El Sendero Luminoso near Monterrey in northern Mexico. What makes this climb special (and slightly scary to watch) is that Honnold climbs solo and without any safety measures such as ropes. 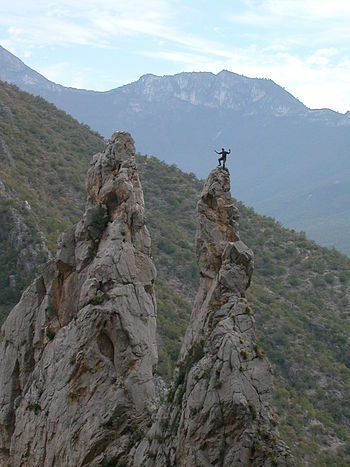 The El Sendero Luminoso rockface is in an area known as El Potrero Chico, a short distance from Monterrey, near the town of Hidalgo. There used to be a sizable international community of rock climbers living in Monterrey. Now I doubt if there are any; it’s just too dangerous for a small group to go out side of the city to take up outdoor activities. There are a few indoor bouldering / rock climbing clubs though, perhaps they came about as a response to the danger of driving off main roads and tracks in bandit country.